Like every little girl my daughter loves the Frozen movie. 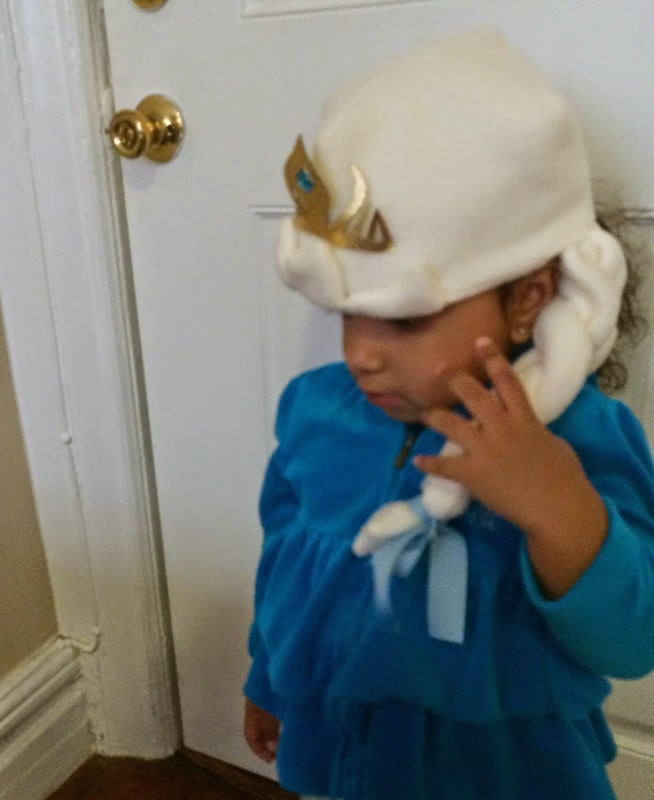 She has these little Elsa and Anna dolls that she takes everywhere with her. I wanted to make her Elsa and Anna hats that she could play with but that would also keep her warm if she wanted to wear them outside. 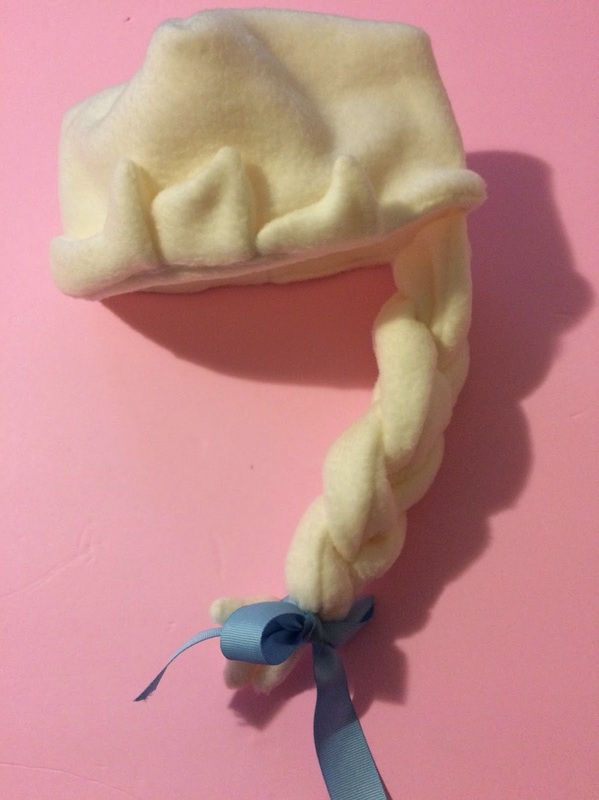 I saw crocheted hats all over the place so I decided to create my own fleece tutorial to make it a bit warmer and softer. 12" piece of turquoise ribbon. I used the instructions from Monkey See, Monkey Do to make the hat. I measured the circumference of my daughter's head and the length from below her eyebrows to the middle of the top of her head to get the measurement for the hat. 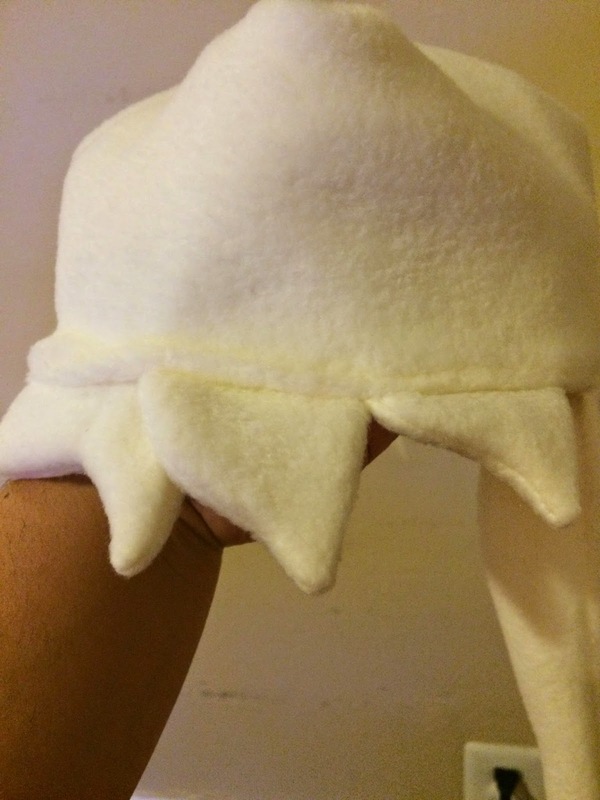 I made two of the main hat and used one as the lining to make it double thickness and warmer. 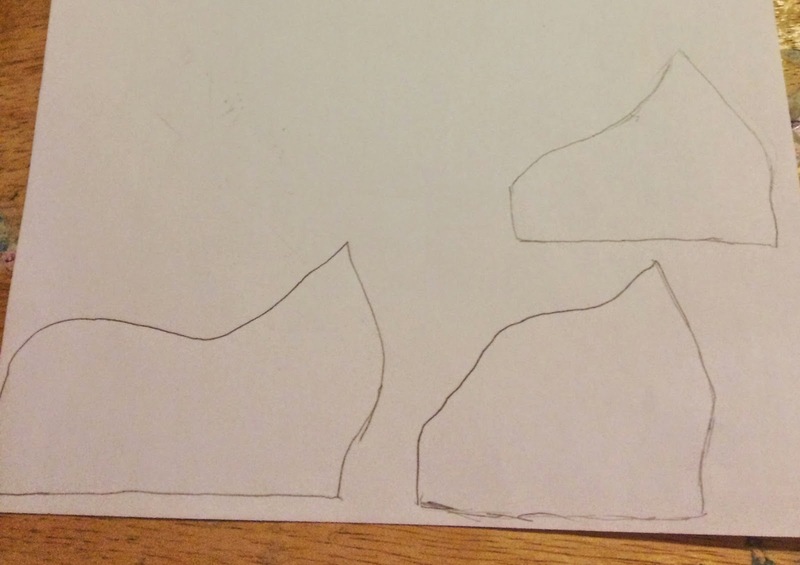 Draw three shapes like the picture below to make the bang shapes. Add a 1/4" seam all around. Cut two pieces of each shape out of the yellow fleece. 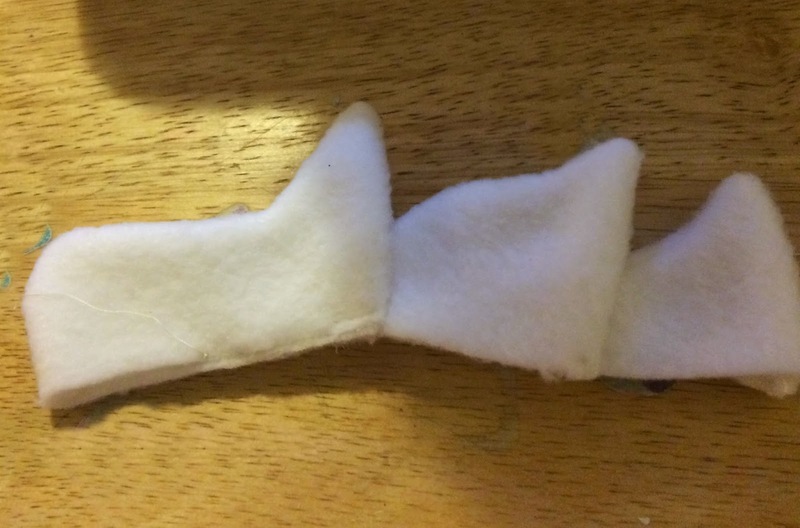 Sew all around each shape except the bottom straight side. Trim seam allowances and turn each inside out. 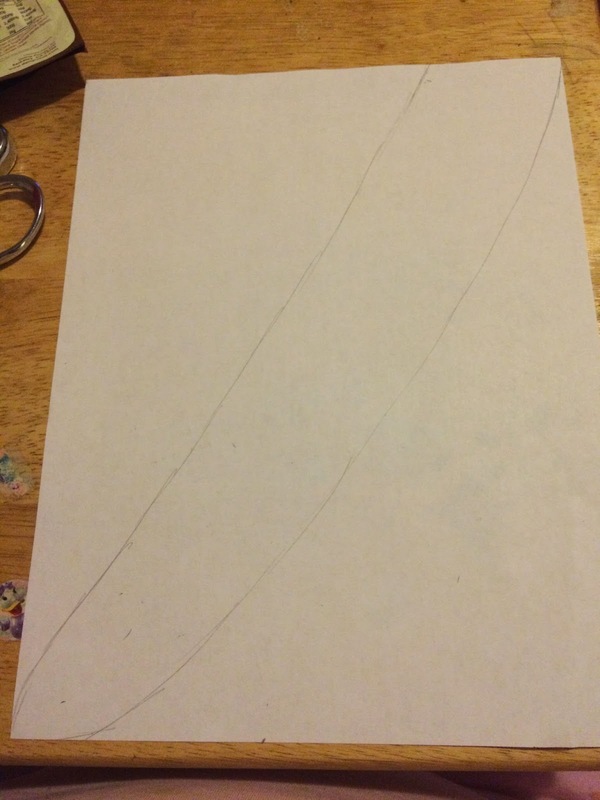 Make a pattern for the braid that is 2 1/4" x 11" long. Taper one of the ends to make more of a hair strip shape. Add a 1/4" seam allowance all around. Cut out 6 pieces of this pattern from the yellow fleece. Take two pieces and place right sides together. 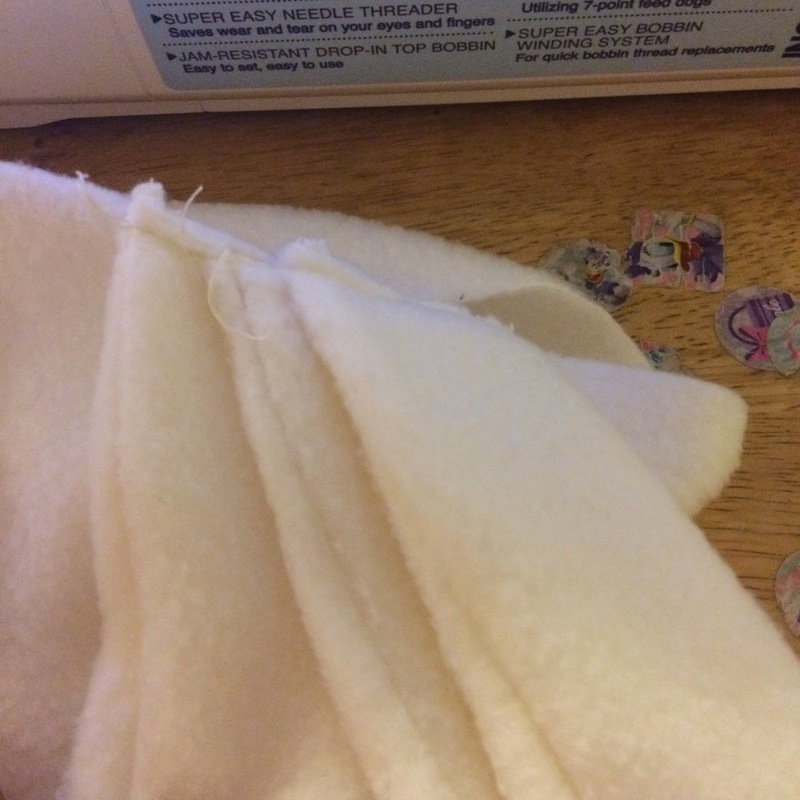 Sew all around using at 1/4" seam except for the straight top side. Trim seam allowances and turn inside out. Repeat two more times. 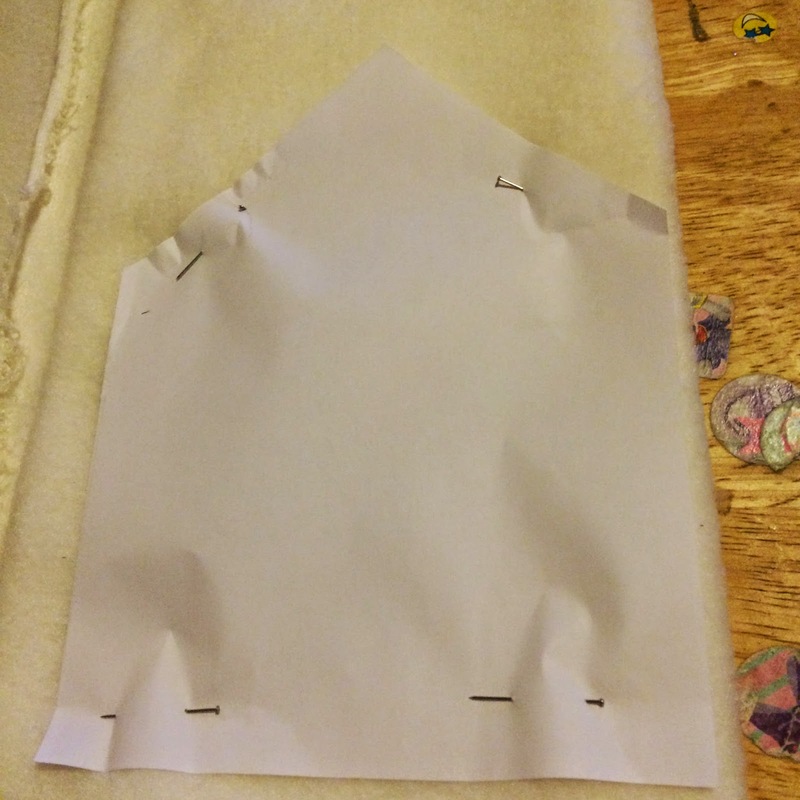 Lay the three bang pieces like the picture below and sew in place. Stack up the three braid pieces staggering a little bit from the top flat side and sew in place. Pin bang pieces to the front middle of the hat. Pin braid to the right side of the hat. You can put it on your model to make sure to pin it right behind the right ear. Place lining hat on top of hat making sure to tuck in bang pieces and braid. Sew around the circumference of hat using a 1/4" seam and leaving a 3 inch opening. Turn inside out and whip stitch the opening closed. 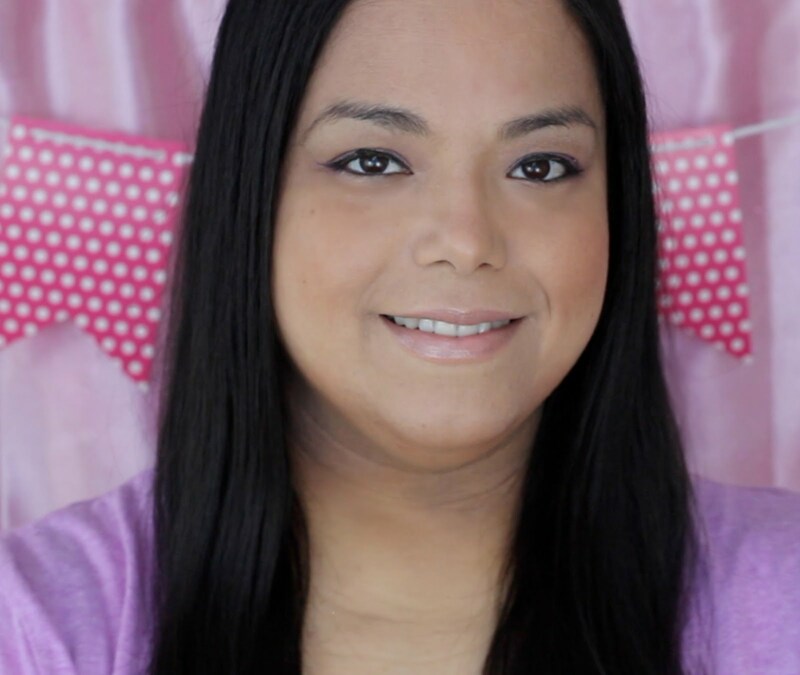 Flip up the bang pieces and sew in place with small hidden stitches. Braid the three pieces of the ponytail and secure with the ribbon making a bow. Trim excess from ribbon. To make the crown I downloaded the pattern from Britta Blvd. I resized it to be 5" by 3" keeping the aspect ratio. Trace the pattern onto the paper side of fusible web. Iron on the fusible web to a 6" by 3" piece of gold fabric. Cut out the crown. 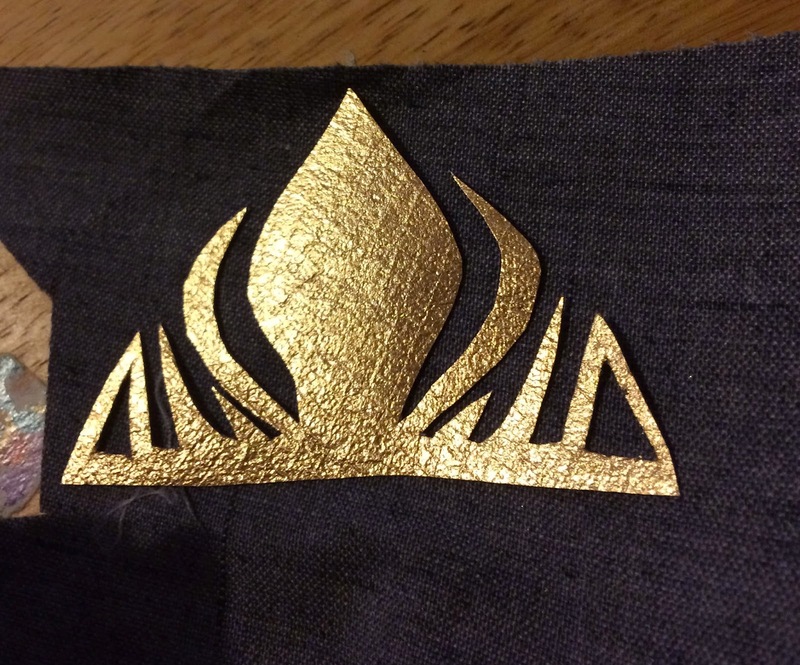 Peel off the paper backing and iron on to another piece of gold fabric. 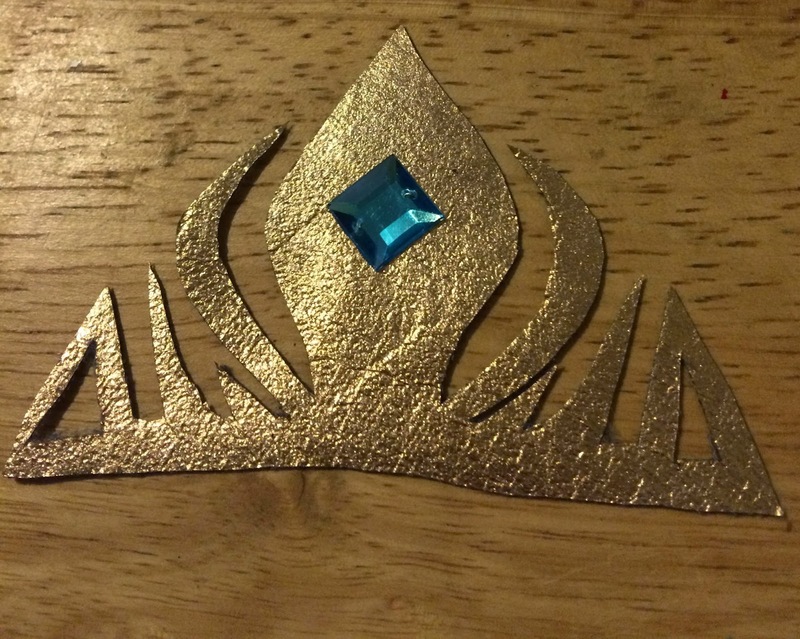 Cut out the crown from second piece of gold fabric. 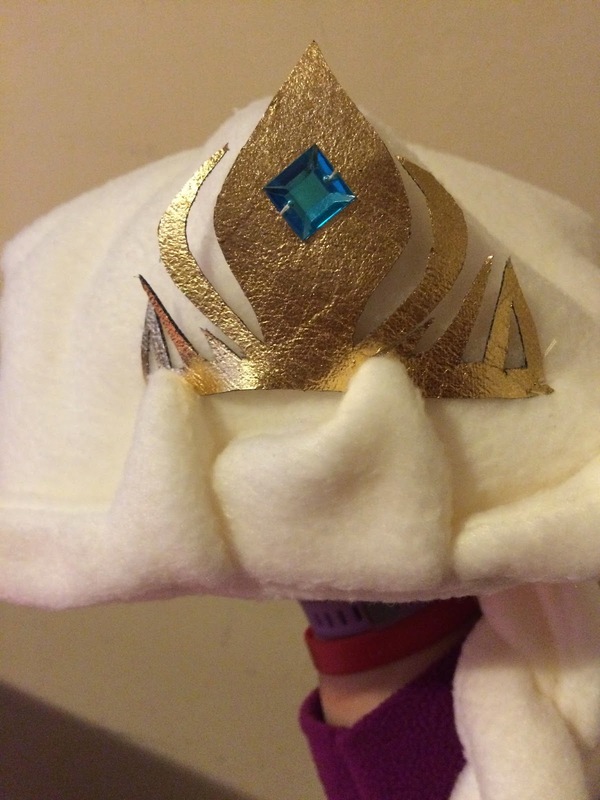 Sew on the turquoise gem to the middle of the crown. 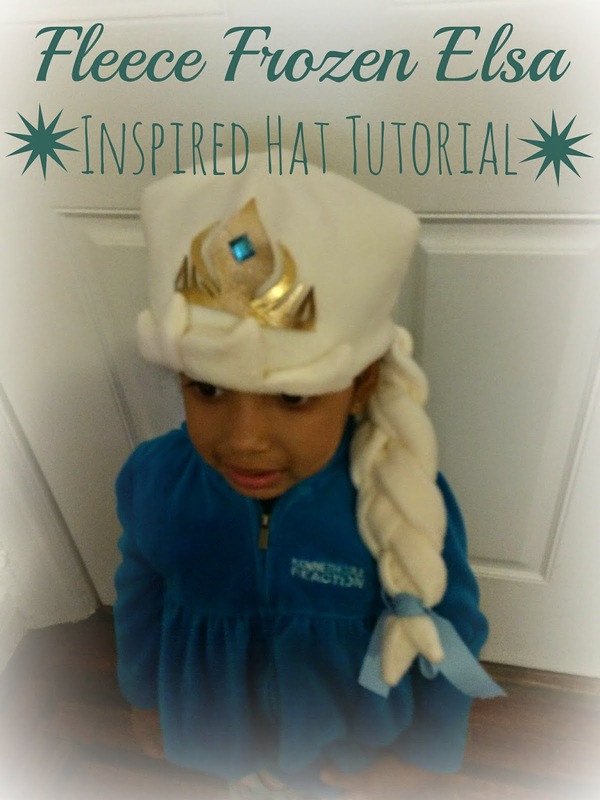 Sew on the crown to the Elsa Hat. How fun! I love the braid! Oh Michelle! That is the most adorable thing ever. I love it! You are just so creative!! That is the cutest thing ever! I might have to make a couple for my nieces. How adorable is that! I love it, and I bet she does as well! 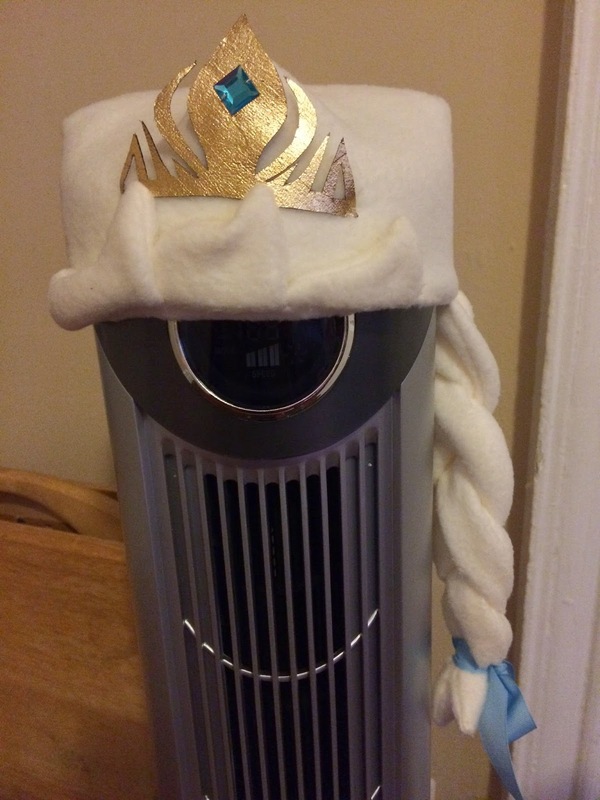 I finally watched Frozen so now I get all excited when I see fun crafts like this! So Adorable and the jewel is perfect! So creative! I could not even begin to follow the instructions correctly, much less come up with it on my own! That is too adorable! My lil' lady would go crazy for it! It is amazing how much of a phenomenon this movie has become. My daughter love anything Frozen.